Cheesy Chicken Fry recipe by Nazia Nazar at DesiRecipes.com. Boil the chicken with the onion . Put 1/2 tsp salt and 1/2 tsp black pepper . Cook till the chicken is tender and dry. Spread out the chicken pieces to cool. Make a thick batter of the egg, milk, cornflour, cheese and mustard powder. Beat well to ensure that there are no lumps. Thickly coat the chicken pieces with the batter. 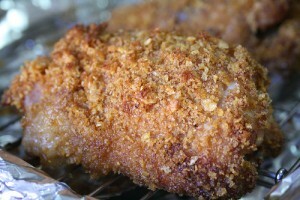 Roll the chicken pieces in the bread crumbs and deepfry till goldenbrown.